Buy and sell unused and used Combine Harvesters at IronPlanet. IronPlanet offers both Tracked Combine Harvesters and Wheeled Combine Harvesters to fit whatever your harvesting needs may be. Browse popular models from top manufacturers including Case Ih Combine Harvesters, John Deere Combine Harvesters, New Holland Combine Harvesters and others. 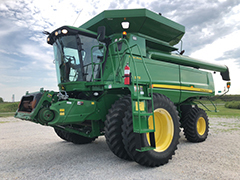 Find IronPlanet and Ritchie Bros. Auctioneers' current Combine Harvester inventory below, and see what Combine Harvesters are for sale around you. View Ritchie Bros Agriculture Harvest Equipment .